Shopping for Fate Stay Night Action Figures? 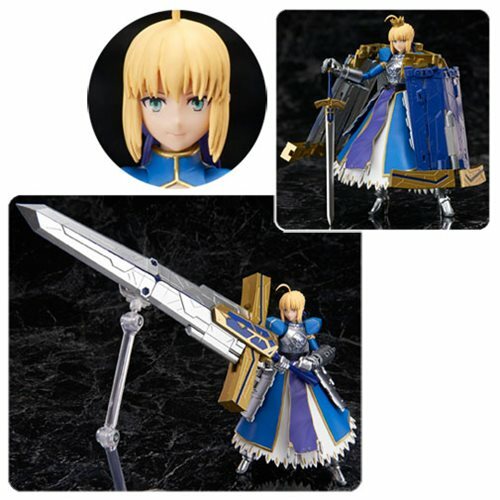 Saber Arturia Pendragon features exquisite detail and poseability. Action figure based on the Fate/Grand Order role-playing game. Her Variable Excalibur transforms from armor into a giant sword! Includes a wealth of interchangeable faces, hands, and other parts! The Armor Plus series builds on know-how from SH Figuarts and Figuarts ZERO to deliver high-quality female figures with wearable armor, like this Fate/Grand Order Saber Arturia Pendragon and Variable Excalibur Armor Action Figure. The role-playing game's Saber Arturia Pendragon features exquisite detail and poseability, plus an original Variable Excalibur that transforms from armor into a giant sword! The 5 1/2-inch tall figure includes 3 expression parts, the Excalibur, a translucent Excalibur, 3 pairs of optional hands (L/R), a combined hands part, a crown, shoulder armor, a breastplate, L/R gauntlets, a waistcloth, a skirt, 2 types of cape attachments (L/R), 2 waist armor pieces, a design part for the sword, 2 blades for the sword, 2 blade tip parts, a grip, 2 Tamashii Stages, and 2 support arms. Ages 15 and up.